This feature allows you to register someone for a group in a “best fit” method. 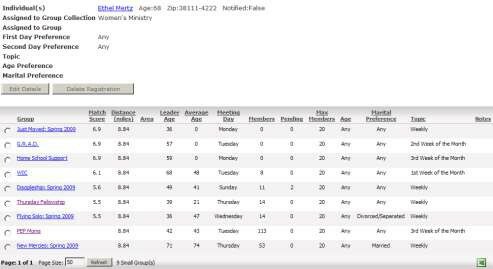 You can use the Add Registration feature when you are not certain of the Small Group in which to enroll a person. A score value determines the “best fit.” The minimum score and score values are set in Organization Settings under Administration. Based on Group Details, the member provides the criteria for a Group that works for the person. Putting these values into the Add Registrations page determines which Groups most closely match the member’s criteria. If a Group matches close enough by score, the member is placed as a Pending member for that Group. If no Groups meet the minimum score, the member becomes an unassigned Registrant, and you have to determine where they should go. 1. From the Groups menu, click the Add Registration option. 2. Click the Add link to search and select for an existing record. 3. 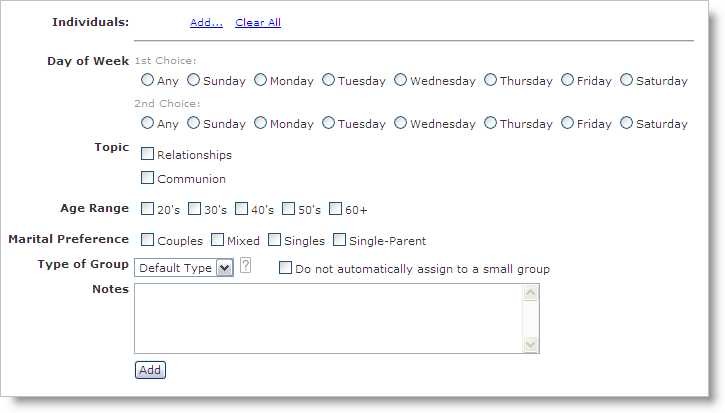 Select the group criteria for this person, including the Type of Group from the drop-down. 4. Select the Do not automatically assign to a small group check box, as desired. This means that the person remains as Unassigned, but in the proper Group Tree as the Group for which the person would have been pending. 5. Click the Add button. Upon completion, Arena does one of the following: If Arena assigns the registrant, the Group Leader receives an email alerting the person of the pending registration. The registrant also receives an email to confirm their registration. If the member is Unassigned, an email is sent to the Leader or Administrator of the Cluster Level to notify them of the registrant, for the leader to assign the registrant to a Group. If multiple classes fit the person’s criteria, administrators or leaders have the ability to assign the person to any of the classes. If the Small Group Leader does not have an email address, the Small Group Cluster Leader receives the email. If the Small Group Leaders and the Small Group Cluster Leaders do not have email addresses, then the email address in the module setting Group Leader Email in the Small Group Locator module gets the email request. All Unassigned and Pending Registrants display on the Registration page. You cannot directly add Unassigned Registrants to a Group; they have to be a Pending registrant first. 1. Click the Registrations tab of the Group Level to view unassigned. 2. Click the registrant’s Name link to display Registrant Details and the list of all groups within the Tree. 3. To assign a person to a group, select the radio button to the left of the Group to which you want them assigned. Click the Assign to Group button. Arena send emails to both the registrant and the group leader. 1. 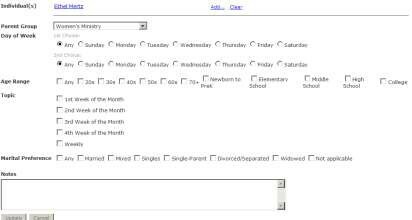 Click the Edit Details button from the registration page. 2. Select the preferred group or change the selection criteria. 1. Select the Registration tab from the Group page. 2. Click the Confirm Registration icon to add the person to the group. 3. Click the OK button on the pop-up to confirm adding them to the group as a Member. 1. From the Registrations tab, click the Name link of the registrant. 2. Confirm the group and click the Assign to Group button.